Adore Jewelers has a big selection of rings, bracelets, chains, charms, earrings & pendants in platinum, 10, 14, and 18 karat white, yellow, and rose gold. Fine Rubies, Sapphires, Emeralds, Garnet, Citrine, Amethyst, Aquamarine, Tanzanite, Topaz, Pearl, Jade and more. Rare and exotic gemstones - with such colors as Tsavorite, Garnet, Imperial Topaz and Sircon. Not to mention a wide variety of Vintage & Estate pieces. Diamonds usually range in color from ice white to various shades of yellow or brown. which will give it a white appearance when mounted. The relative “purity” of a diamond helps determine its "rarity", and its cost or value. The more "pure" a diamond is, the rarer it is. The industry standard for "clarity" is what an "expert" can see internally in a diamond with a 10x loupe. A "flawless" diamond is one in which an expert cannot see any imperfection. Carat is often thought of as size when it actually is a measure of weight. One carat is equal to 200 milligrams. Diamonds are most commonly referred to in “points.” 100 points equals one carat. For example, 75 points equals 3/4 of a carat. Cut refers to the angles and proportions an artisan creates in transforming a rough diamond into a polished diamond. 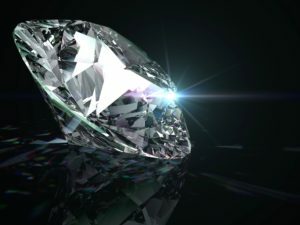 through the upper surface of a diamond, rather than have it “leak” out the bottom of the diamond.